1. I live in Cheyenne, Wyoming. I am a former Bureau of Land Management (“BLM”) official with extensive experience in the Rawlins and Rock Springs Districts in Wyoming and intimate familiarity with the public lands under BLM management in those areas. I have reviewed the consent decree proposed by BLM and the Rock Springs Grazing Association (“RSGA”) in this case and provide this declaration based on my longstanding knowledge of, and management of, wild horses and livestock grazing in the Rock Springs and Rawlins Districts. 2. I grew up in Pine Bluffs, Wyoming with a livestock and farming background, served in the Marines for four years, and then owned a livestock business from 1952-1958. I enrolled in college in 1958, studying range management. From 1960-1961, BLM hired me to assist with collecting field data for vegetation assessments and carrying capacity surveys related to livestock and wild horses. These surveys were conducted in the Lander, Kemmerer, and Rawlins Districts. When I graduated in 1962, BLM hired me full-time to serve in the Rawlins District in Wyoming, where most of my work focused on grazing management involving sheep, cattle, and wild horses. 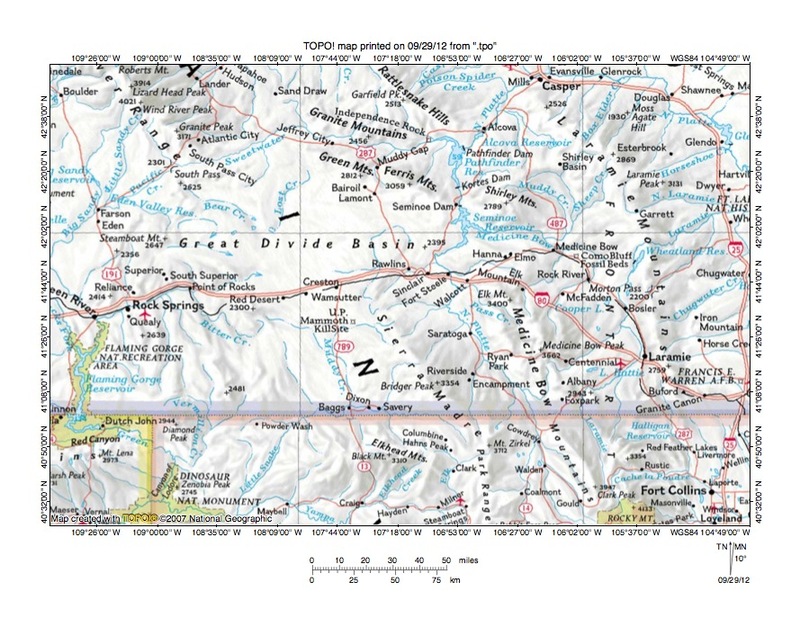 From 1968-1972, I was Area Manager of the Baggs-Great Divide Resource Area in the Rawlins District. In 1971, the Wild Free-Roaming Horses and Burros Act was enacted, and in the spring of 1972, on behalf of BLM, I conducted the first aerial survey of wild horses in Wyoming, recording the number of horses and designating the Herd Management Areas (“HMAs”) for the Rawlins District. After a stint as an Area Manager with BLM’s Albuquerque, New Mexico office, in 1975 I took over as the Chief of Planning and Environmental Analysis in BLM’s Rock Springs District for three years. I was the lead on all planning and environmental assessments. During that time, I also served as the Acting Area Manager of the Salt Wells Resource Area, which is located in the Rock Springs District. In 1979, BLM transferred me to its Denver Service Center to serve as the Team Leader in creating the agency’s automated process for data collection. I received an excellence of service awardfrom the Secretary of the Interior commending me for my work as a Team Leader. In 1982, I became the Head of Automation in BLM’s Cheyenne office, where I managed and implemented the data collection and processing of various systems related to BLM programs. I retired from BLM in 1986, and have stayed very involved in the issue of wild horse and livestock management on BLM lands in Wyoming, and have written articles about the issue in local and other newspaper outlets. I have won various journalistic awards, including a Presidential award, for my coverage of conservation districts in Wyoming. Along with a partner, I operated a tour business (called Backcountry Tours) for six years, taking various groups into wild places in Wyoming – without a doubt wild horses were the most popular thing to see on a tour, in large part due to their cultural and historical value. I also served six years on the governor’s non-point source water quality task force. 3. Based on my longstanding knowledge of wild horse and livestock management in the Rawlins and Rock Springs Districts, and in the Wyoming Checkerboard in particular, I am very concerned about BLM’s agreement with RSGA, embodied in the proposed Consent Decree they have filed in this case, under which BLM would remove all wild horses located on RSGA’s private lands on the Wyoming Checkerboard. The Checkerboard is governed by an exchange of use agreement between the federal government and private parties such as RSGA. However, due to state laws, property lines, and intermingled lands, it is impossible to fence the lands of the Wyoming Checkerboard, which means that both the wild horses and the livestock that graze there roam freely between public and private lands on the Checkerboard without any physical barriers. For this reason, it is illogical for BLM to commit to removing wild horses that are on the “private” lands RSGA owns or leases because those same horses are likely to be on public BLM lands (for example, the Salt Wells, Adobe Town, Great Divide, and White Mountains HMAs) earlier in that same day or later that same evening. Essentially, in contrast to other areas of the country where wild horses still exist, on the Wyoming Checkerborad there is no way to distinguish between horses on “private” lands and those on public lands, and therefore it would be unprecedented, and indeed impossible for BLM to contend that it is removing all horses on RSGA’s “private” lands at any given time of the year, month, or day, considering that those horses would only be on the strictly “private” lands very temporarily and intermittently on any particular day . 8. In addition, because livestock tend to eat somewhat different forage than wild horses (horses tend to eat coarser vegetation such as Canadian wild rye and other bunch grasses, whereas cattle and sheep mostly eat softer grasses), there is no justification to remove wild horses on the basis that insufficient forage exists to support the current population of wild horses. Also, because cattle and sheep have no front teeth on the front part of their upper jaws, they tend to pull and tear grasses or other forage out by the root causing some long-term damage to vegetation, whereas wild horses, which have front teeth on both their front upper and lower jaws, act more like a lawnmower and just clip the grass or forage (leaving the root uninjured), allowing the vegetation to quickly grow back. These differences are extremely significant because if there were a need to reduce the use of these BLM lands by animals to preserve these public lands, it might be cattle and sheep – not wild horses – that should be reduced to gain the most benefit for the lands, and which is why BLM, during my time as an agency official, focused on reducing livestock grazing. 9. BLM’s agreement with RSGA states that RSGA’s conservation plan limited livestock grazing, primarily by sheep, to the winter months to provide sufficient winter forage.This is a good example of “multiple use” management, since wild horses and sheep have very little competition for the forage they consume and the seasons during which they use parts of the Checkerboard. During winter, sheep use the high deserts and horses utilize the uplands and breaks (i.e., different locations) for forage and protection. During the summer, when sheep are not present, wild horses use various landscapes on the Checkerboard. This multiple use should continue for the benefit of the livestock, the wild horses, and the public and private lands involved. 11. The zeroing out of wild horses in the Salt Wells and Divide Basin HMAs is also concerning because it would mean that, in those two longstanding HMAs, there would no longer be the “multiple use” of these public lands as required by both the Wild Horse Act and the Federal Land Policy and Management Act. 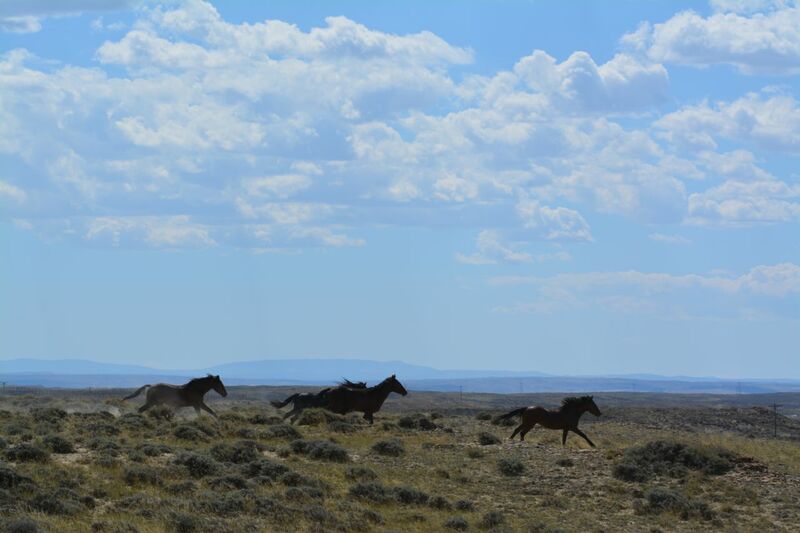 Currently, while there are other uses of this public land, such as by wildlife, hunters, and recreational users, the two primary uses in those HMAs are by wild horses and livestock. If BLM proceeds with its agreement with RSGA to zero out wild horses in those HMAs, the only major use remaining would be livestock use, meaning that there would be no multiple use of those BLM lands. Not only will that potentially undermine the laws that BLM officials must implement here, but it has practical adverse effects on the resources – multiple use is very beneficial for the environment, and particularly for sensitive vegetation, because different users (e.g., livestock, wild horses) use the lands and vegetation in different ways. When that is eliminated, the resources are subjected to an unnatural use of the lands which can cause severe long-term damage to the vegetation. As a result, zeroing out these herds would likely be devastating for the vegetation in these two HMAs, because livestock would be by far the predominant use in this area. Pursuant to 28 U.S.C. § 1746, I declare under penalty of perjury that the foregoing is trueand correct. Why is the Wyoming Office of Tourism using ROAM FREE to bring tourists when the WYOMING wild horses are being brutally rounded up in the snow? Send your original comments in today! 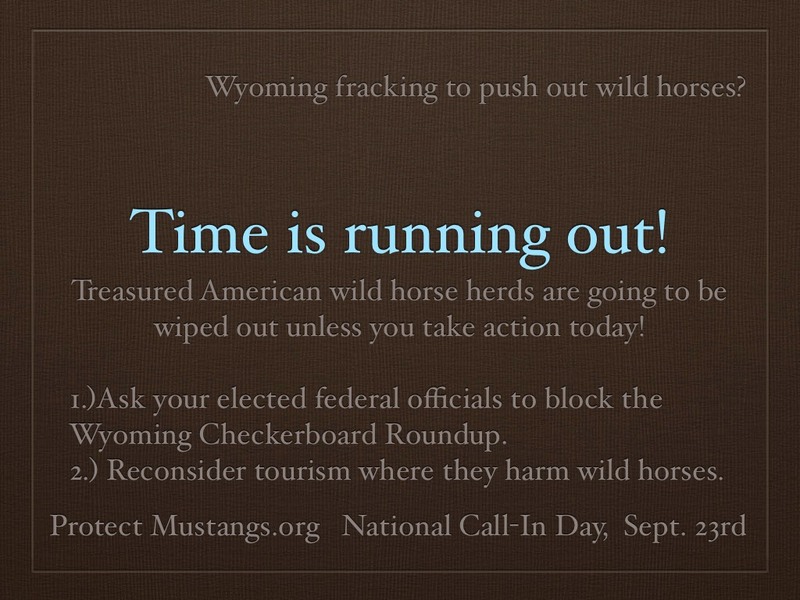 We request you do not roundup, remove, kill, give birth control or sterilize wild horses in Wyoming’s Checkerboard area. We call for a moratorium on roundups in the Checkerboard and elsewhere for immediate scientific population studies lasting 10 years. Fertility control (birth control, sterilization, etc.) must not be used before 10-year population studies. We request an investigation into conflict of interest governing discussions and decisions for removals of the Checkerboard wild horses in Wyoming. Federal law cannot be violated under a consent decree. American wild horses are legally allowed to roam on the 2.3 million acres under the Free Roaming Wild Horse & Burro Act of 1971. It’s important to uphold the law. Non-reproducing herds are not protected wild horses according to the 1971 Act as they would be harassed in order to be sterilized. Also their social structure and their natural behaviors would ruined if sterilized. The wild horses mentioned are a national living treasure and historically significant. They benefit the ecosystem as well. 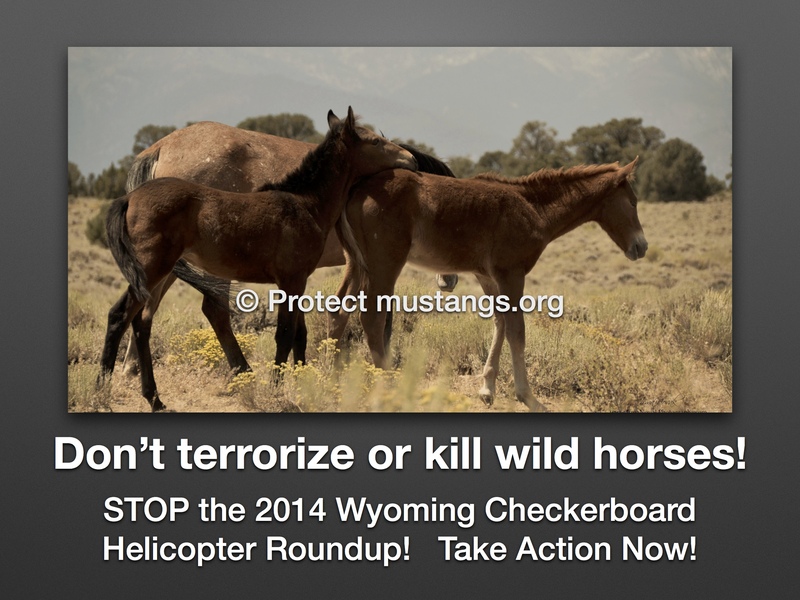 Do not remove horses from or zero out the Divide Basin herd and do not kill or sterilize. Do not remove horses from or zero out the Salt Wells herd and do not kill or sterilize. Do not remove horses from or reduce the AML (number of wild horses) for the Adobe Town herd and do not kill or sterilize. Do not remove horses from or reduce the horses at White Mountain and do not kill or sterilize. Do not remove horses from or reduce the horses at Little Colorado and do not kill or sterilize. Members of our organization have visited the herds for research, inspiration, photographic and other artistic projects and plan to do so in the future. 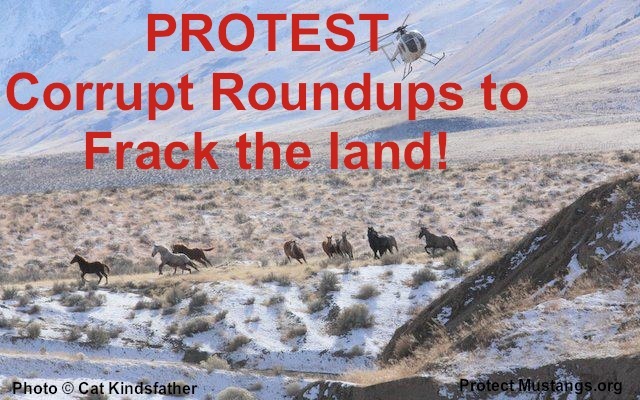 We request you do not interfere in their work by removing wild horses. Rounding up and removing any wild horses in the Checkerboard area or performing killings or sterilizations in the field will increase global warming due to increased motorized vehicle usage on the range as well as damage the fragile ecosystem. Tourists, researchers and students don’t want to hear about a bunch of killed horses nor do they want to see a bunch of sterilized horses out on the Checkerboard. Sterilized horses loose their natural behaviors. The essence of their social structure–the family band–would be destroyed. 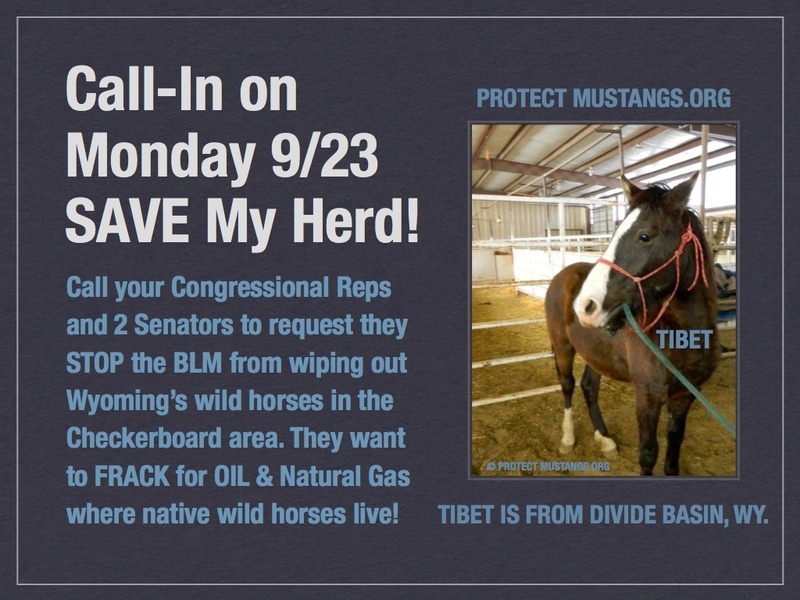 Removing American wild horse to frack the land is wrong. Have you seen GASLAND 2? 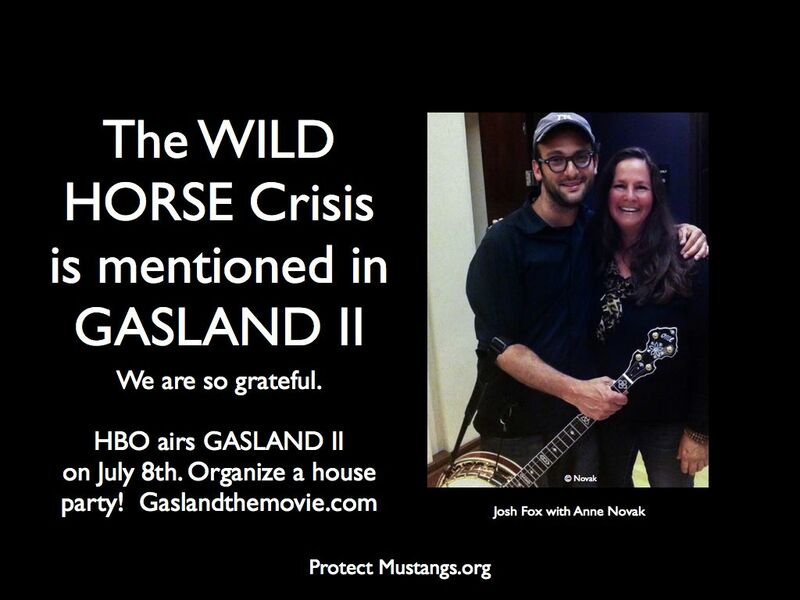 It talks about why beloved American wild horses are being removed in Wyoming! Millions of people have seen the new film on HBO and around the world. Now everyone realizes you are willing to remove the wild horses to facilitate fracking and other energy/mining interests on the Checkerboard area because of the money you receive from the extractive industry. We look forward to hearing from you regarding our request for an immediate 10-year moratorium on roundups, trapping and removals for population studies. The wild horses in question belong to the American people. The Bureau of Land Management has been put in charge to protect them. Please do your job.